Your sinuses are air-filled spaces inside the bones of the face. They produce mucus that drains through narrow channels into the nose, helping to clear any dirt or bacteria that has been breathed in. If the sinuses become blocked, for example following a cold or because of an allergy, the sinuses continue to produce mucus, often in greater quantities, which then becomes trapped in the sinus. As there are bacteria in the nose and sinuses, this mucus can be become infected, which causes further inflammation and blockage of the sinuses, creating a vicious circle. A balloon sinuplasty is a minimally invasive procedure that gently opens the drainage channels and helps to clear blocked sinuses. The idea of balloon sinuplasty came from cardiology, where balloons have been used for many years to unblock clogged arteries in the heart. Balloon sinuplasty has now been used for over a decade and has proved a safe and effective alternative for the treatment of sinus problems. It can be performed whilst you are awake after the nose has been numbed with local anaesthetic (this is sometimes called an 'office' procedure) or whilst you are asleep under a general anaesthetic. What is Mr Hamann's experience with Balloon Sinuplasty? Mr Hamann was one of the first surgeons in the UK to perform balloon operations on the nose and sinuses, and has been regularly undertaking such procedures for approaching ten years. He has subspecialist training in nose and sinus problems, which form the majority of his practice. He currently performs more balloon procedures than any other surgeon in the UK. AM I A SUITABLE CANDIDATE FOR A BALLOON SINUPLASTY PROCEDURE? Before having balloon sinuplasty, you will need a careful examination of the nose and sinuses to identify the cause of the problem. This usually involves inserting a small telescope into the nose (click here for more information). In many cases, medical therapy can be used to treat sinus conditions, even if they have been present for months or years, so it is often appropriate to try this before having an operation on the sinuses. Before having any operation on the sinuses, a CT scan of the sinuses is required, in order to get a precise map of the anatomy of the sinuses, which can vary considerably from person to person. If there are restrictions to the sinus openings then a balloon sinuplasty may be an effective treatment option. However, a deviated septum or nasal growths or polyps may also require surgery. WHAT DOES A BALLOON SINUPLASTY PROCEDURE ENTAIL? A tiny catheter with a deflated balloon is guided through the nostrils and into the blocked sinus. The balloon is then gently inflated to expand and open up the passages. The inflamed sinus can then be flushed if required, clearing out the built-up mucus. The balloon is then deflated and removed. The precise length of procedure varies from person to person, as the anatomy of the sinuses is highly variable. On average, the procedure usually takes about 30 minutes and is usually performed in the operating room. An overnight stay in hospital is not required and most patients can go home a couple of hours after the procedure. WHAT IS THE RECOVERY PROCESS LIKE AFTER A BALLOON SINUPLASTY? As there are no incisions and much less trauma to the tissues, recovery is usually rapid, and most patients find they are fully recovered within a couple of days. Most patients can resume normal activities two days after surgery, although this does vary from person to person. WHAT ARE THE POTENTIAL RISKS OR COMPLICATIONS ASSOCIATED WITH A BALLOON SINUPLASTY? This procedure is minimally invasive, and the potential risks are very small. As with any nasal procedure, heavy nosebleeds can occur and there is a small risk of infection. Injury to the eye causing bruising and a leak of the fluid surrounding the brain through the nose (CSF leak) have been reported with this procedure, but are exceptionally rare. The risk of this occurring is considerably lower than with traditional endoscopic sinus surgery, making this a very safe procedure. Occasionally, a balloon sinuplasty will not resolve the problem. In this instance, a repeat procedure can be performed or alternative sinus surgery may be recommended. The UK National Institute for Health and Clinical Excellence (NICE) reviewed the evidence for balloon sinuplasty in 2016. They concluded that balloon sinuplasty for chronic sinusitis was as effective as conventional sinus surgery (also known as Functional Endoscopic Sinus Surgery or 'FESS') but with faster recovery and fewer complications. If i have had balloon sinuplasty, can i still have other forms of sinus surgery? Yes, absolutely. 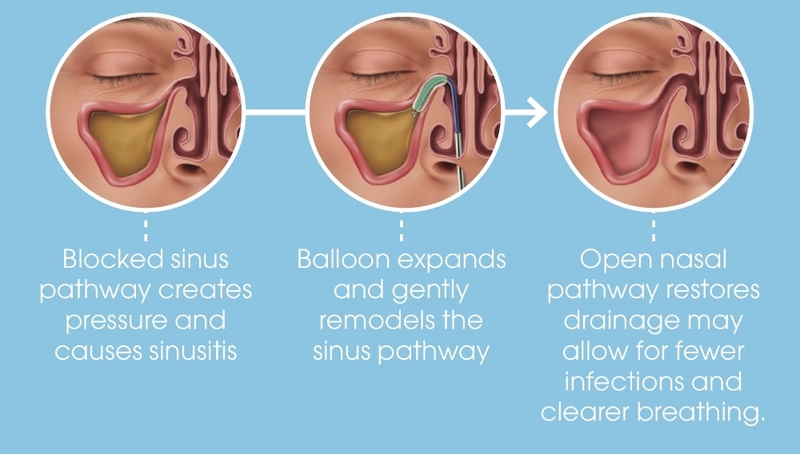 Balloon sinus surgery doesn't involve the removal of any tissue, so the anatomy of the sinuses only changes minimally. You can still have any other form of sinus surgery if required. More information about balloon sinuplasty can be found on the manufacturer's website Entellus Medical.